Abstract. 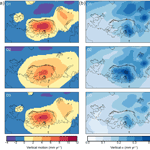 The glacial isostatic adjustment (GIA) signal at present day is constrained via the joint inversion of geodetic observations and GIA models for a region encompassing northern Europe, the British Isles, and the Barents Sea. The constraining data are Global Positioning System (GPS) vertical crustal velocities and GRACE (Gravity Recovery and Climate Experiment) gravity data. When the data are inverted with a set of GIA models, the best-fit model for the vertical motion signal has a χ2 value of approximately 1 and a maximum a posteriori uncertainty of 0.3–0.4mm yr−1. An elastic correction is applied to the vertical land motion rates that accounts for present-day changes to terrestrial hydrology as well as recent mass changes of ice sheets and glaciered regions. Throughout the study area, mass losses from Greenland dominate the elastic vertical signal and combine to give an elastic correction of up to +0.5mm yr−1 in central Scandinavia. Neglecting to use an elastic correction may thus introduce a small but persistent bias in model predictions of GIA vertical motion even in central Scandinavia where vertical motion is dominated by GIA due to past glaciations. The predicted gravity signal is generally less well-constrained than the vertical signal, in part due to uncertainties associated with the correction for contemporary ice mass loss in Svalbard and the Russian Arctic. The GRACE-derived gravity trend is corrected for present-day ice mass loss using estimates derived from the ICESat and CryoSat missions, although a difference in magnitude between GRACE-inferred and altimetry-inferred regional mass loss rates suggests the possibility of a non-negligible GIA response here either from millennial-scale or Little Ice Age GIA. How to cite: Simon, K. M., Riva, R. E. M., Kleinherenbrink, M., and Frederikse, T.: The glacial isostatic adjustment signal at present day in northern Europe and the British Isles estimated from geodetic observations and geophysical models, Solid Earth, 9, 777-795, https://doi.org/10.5194/se-9-777-2018, 2018. 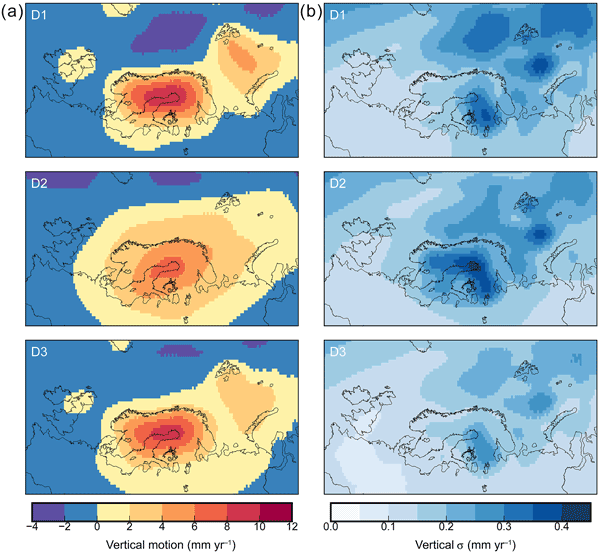 This study constrains the post-glacial rebound signal in Scandinavia and northern Europe via the combined inversion of prior forward model information with GPS-measured vertical land motion data and GRACE gravity data. The best-fit model for vertical motion rates has a χ2 value of ~ 1 and a maximum uncertainty of 0.3–0.4 mm yr−1. An advantage of inverse models relative to forward models is their ability to estimate formal uncertainties associated with the post-glacial rebound process.